The Downtown Awbrey is a modern-contemporary home designed by HGTV's interior designer Shannon Quimby. Located on desirable Awbrey Road, you can walk everywhere! Featuring upscale furnishings, European style bedding, fully equipped gourmet kitchen, hot tub & cruiser bikes. A stunning home with a hot tub in an exceptional location one block off of Newport Avenue and two blocks from Mirror Pond, you can stroll through Drake Park to all of the shops, restaurants, breweries, and pubs in downtown Bend. Take a ride on one of the 4 cruiser bikes provided, meander through Bend's charming Westside neighborhoods, and you are in the heart of downtown, or in the Old Mill district in minutes! The Downtown Awbrey features a spectacular, sunny and bright, open floor plan with gorgeous hardwood floors and high-end finishes and decor. Cozy up to the gas fireplace and watch a movie on the HDTV in the living room, or make a gourmet meal in the fabulous fully equipped kitchen featuring stainless appliances, a gas range, glass tile, and super-cool retro light fixtures. There is sit down dining for 8, plenty of room to accommodate your family and friends, and create memories that will last a lifetime! The master bedroom features a king size bed with a down duvet and an HDTV. There is a fabulous master bath with a glass tile shower and double vanity sinks. There is also a large walk-in closet for your use. The second bedroom has a queen bed with high and lofty ceilings that give the room a spacious feeling. The third bedroom provides 2 sets of bunk beds that sleep 4. Enjoy outside living “Bend style” while you and your friends cook out on the gas grill and enjoy dinner on the covered patio, there is outside seating for eight! Or, soak in the hot tub after a day out on the trails. • Fantastic Westside location, WALK EVERYWHERE! • Sunny open floor plan perfect for family and friends! With a great location and lovely interior, our stay was wonderful. The kitchen is well designed and completely stocked with all types of pots, pans and storage containers. Theres plenty of room to eat (kitchen island + dining room table) and the living room is very comfortable. The bedrooms are well sized and beds comfy. Bathrooms are great with lots of towels. Hot tub is super. Bikes and extra chairs available in garage. Fantastic house!! Bend is an amazing city and the house is centrally located in the middle of all the fun! The house was beautiful and very close to downtown and other places. This is a good place to stay if you want to do the ale trail! Location, location, location! Not only was our vacation home immaculate and extremely comfortable, our stay on Awbrey St. was literally a gateway to downtown Bend and its magical surroundings. Simply put, we walked to the breweries and restaurants we wanted to go. Convenience personified! Rebecca and Paige of Bluebird Day were very responsive and reached out to us to make us feel welcome, plus quickly answered questions when they came up. The house was in excellent shape upon arrival and we quickly felt comfortable and at home. Beds were comfy, shower water hot and plentiful, supplied with nice shampoo and soap, and the kitchen great. I really liked the big stove and plenty of counter workspace in the kitchen - really nice. The dining room had a big table that fit our whole group. All in all, fabulous location, lovely neighborhood, and very functional and stylish home. Perfect location to get around without a car and love the space inside to accommodate two families! Clean and well equipped. We loved everything about the property, from the hot tub to the cozy fire place. We were able to walk to the park, dinner, coffee and of course shopping! Such a convinent location! Spacious, modern, comfy and clean house, very close to restaurants and river in Bend. We were visiting Bend for a cycle race and there was ample room to store our bikes in the garage. Would highly recommend for a group of 6-8. Gorgeous home in a perfect location for walking to downtown Bend. Our college minireunion group of 5 had such a lovely time in this beautiful home...I think it must be recent construction, and this home could have been in any magazine...just lovely. What a perfect location to spend some time in Bend Oregon. This is a beautiful home. It felt like we were the first ones to stay in a new home. Furnishings were out of a magazine. You can walk to town enjoying the beautiful river along the way. Its only six minutes to downtown Bendfrom this lovely home. Everything was great!!! Just what we were looking for. This house was great. We had a wonderful time in downtown Bend. The location was perfect. We rode bikes down town for dinner. We would definitely stay here again. Our family of 4 met a family of 3 and stayed at this amazing rental for a long weekend. 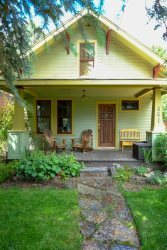 It is a great location -- close to downtown and the Deschutes River. The house is well-stocked, well-decorated and very comfortable. Its the kind of place that would sell for over the asking price if it was ever on the market. I would absolutely stay here again. 6 of us stayed here for a weekend to do a relay run in Bend. We chose it for the location and werent disappointed. We were able to walk everywhere we wanted to go. The house is GORGEOUS and very clean. We all commented on how beautiful it was and how well decorated and stocked it is. Love the speaker system with Pandora radio for music throughout the house and on the patio with the hot tub. We couldnt say enough about how perfect this place was. Not one bad thing to say. This property is immaculate, I wish we could have stayed longer. In addition to being beautiful it was close to all Bend has to offer. I would definitely recommend to anyone. We spent the weekend here in March. It must have been the first warm weekend of the year and it was perfect! The house is absolutely gorgeous, with a beautiful kitchen, awesome grill, and comfortable areas for hanging out. We sat out on the front porch in the sun and kept meeting all the friendly neighbors. The location is perfect. We wandered in and out of town (5 minute walk). I went for runs along the river and wandered around exploring. I cant wait to go back! Thanks for a fabulous Memorial Day Weekend Destination! The house was beautiful, and in a great location! We loved spending time here, what a great space! We had the pleasure of staying in this brand new home during a recent mini family reunion. The house was very thoughtfully appointed, including amenities for small children, as well as cruiser bikes in the garage. The location is perfect for walking to downtown, and hitting the riverfront trails. We hope to be back! We rented this home with two other couples (three couples total) for a long weekend. We have stayed at different homes in Bend over the years and this is the best we have stayed in. First, the location is a short walk across the bridge to downtown Bend, and a nice walk to Chow for breakfast as well. Second, the home itself should be in a design magazine. The interior details/design are very well done, while at the same time exuding a relaxing Bend vibe. There is a master bedroom and two other bedrooms upstairs, one of which has four bunk beds (two bunk beds with two beds each). My wife and I actually took the bunk bed room, which was really comfortable. There is an outdoor patio in the back of the house, with you can play music to from the A/V setup. The home also comes with four bikes in the garage. I took one on a lengthy mountain bike ride and it held up well. Overall, I highly recommend this home. Its quintessential Bend. Nice, and relaxing. Thank you for the beautiful vacation rental! Your home was so comfortable and gorgeous. Our family thoroughly enjoyed it while we were here. Again, our thanks! What a beautiful house with a very well equipped kitchen. We had a great time. Thanks! Two couples rented this house for a long weekend in Bend. It was terrific. Well equipped, clean and comfortable in a great location to boot. We would definitely rent there again. Our family group of 6 rented this home for a week and had a marvelous stay! The house is gorgeous. We arrived late and everything was exactly as it was depicted in the video/pictures. We greatly appreciated the small touches that made the late arrival easier (coffee, paper products, soap/shampoo, etc.) The location was perfect - a quick walk to downtown with shopping and restaurants, but still in a quiet neighborhood. We had many family meals and played cards in front of the gas fireplace. We highly recommend it! We spent six nights at this beautiful home, conveniently located near downtown. The house was appropriately stocked with all the kitchen cookware, coffee pot, papertowels, soap, shampoo, TP etc. The pictures of the property were accurate and the access on check in day went as planned. The whole process from start to finish was spot on. The new hot tub was a nice way to relax after a day of skiing.